I’ve been slacking on my CotW features recently, and I apologize. There are 2 excuses I have. First, I’ve been busy, both getting the podcast running again and Second, sometimes I just don’t end up reading a chapter of manga in a given week that makes me particularly passionate. I only read about 20-30 chapters of current stuff a week and generally have 1-3 marathon series on my back burner. Recently, I’ve been reading Part 5 of Jojo’s Bizarre Adventure and Takano Ichigo’s Orange. Both were good manga, and I might have more to say about them in the long run, but there wasn’t one point in either of them that jumped out as self-evident greatness. But a win-obsessed former bottom-feeding baseball team led by a charismatic pitcher-owner winning the pennant by taking 3 games in a row, on the road, against the team that ultimately finished in second place? While spoiling their opponent’s victory party each time? That’s some fine stuff. Drawing good manga is about making characters feel real. There are any number of paths to achieve this, but if an author can’t make his cast feel compelling early in, the series typically isn’t worth continuing. 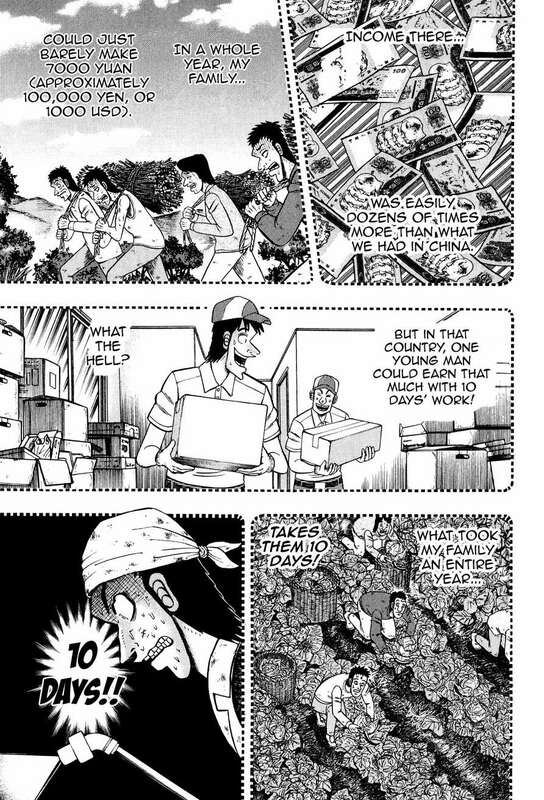 There are few manga artists I trust more than narrative-box placement specialist Noboyuki Fukumoto when it comes to delivering that whole package. The fourth part of his award-winning Kaiji series had been relatively bland by his standards up to this point, lacking real moments from the title character as it focused on 3 brand-new characters stuck in what I’m sure will eventually turn out to be an iterated prisoner’s dilemma. It was enjoyable, but not intense. This chapter broke through that ceiling, though, delivering some heart-warming backstory for Chang, an illegal immigrant and second son under China’s one-child policy. There is no one distinct flavor to the enjoyment of manga. It’s one of the main reasons I kept coming back to it despite getting burned out on various genres of series at various times. Sometimes Manga blows you away with script, sometimes with storyboard, sometimes with sweeping artstyle. Each manga has its own individual approach, and, though there may not be a right occasion for every manga, there’s a right manga for every occasion. In some ways, it might seem harder to talk about more episodic series as candidates for being the best at anything. But that thought process gets lost in the fact that there are stories that work better told as little anecdotes rather than massive epic sagas. Sometimes a nice story about a couple sneaking into a school to watch some fireworks is all a guy needs. I’m picking Mysterious Girlfriend X this week because a chapter came out, because it was cute, and because I liked it. 20th Century Boys, and Naoki Urasawa’s work in general, may borrow from popular culture quite a bit. However, he may be ill-matched by Hirohiko Araki, the author of long-runner Jojo’s Bizarre Adventure. 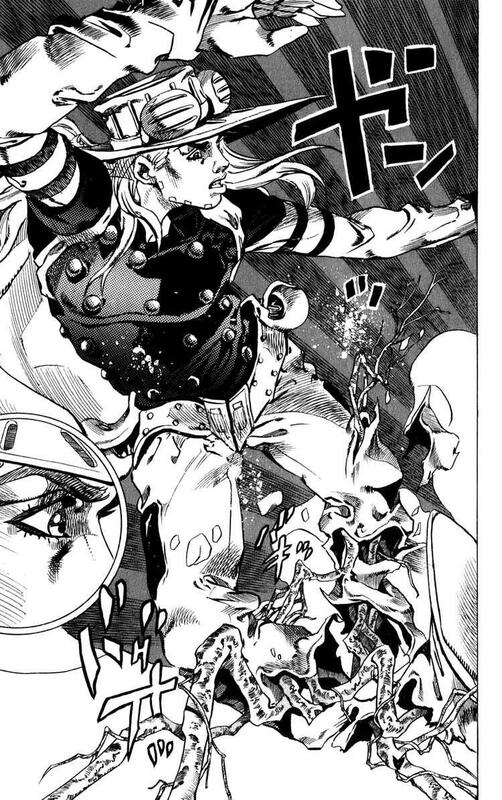 If you know of JJBA, you may be aware of the fact that the author regularly copies the poses of fashion models and the everythings of the music industry. He also, midway through the series’ fourth installment, manages to parody the movie Speed. You know, the one where a large number of innocent commuters are stuck on a bus and if the bus goes slower than 50 miles per hour, it blows up? Just replace the bus with a motorcycle and the blowing up with crippling dessication, and you’ve got a pretty good idea of how this arc goes. 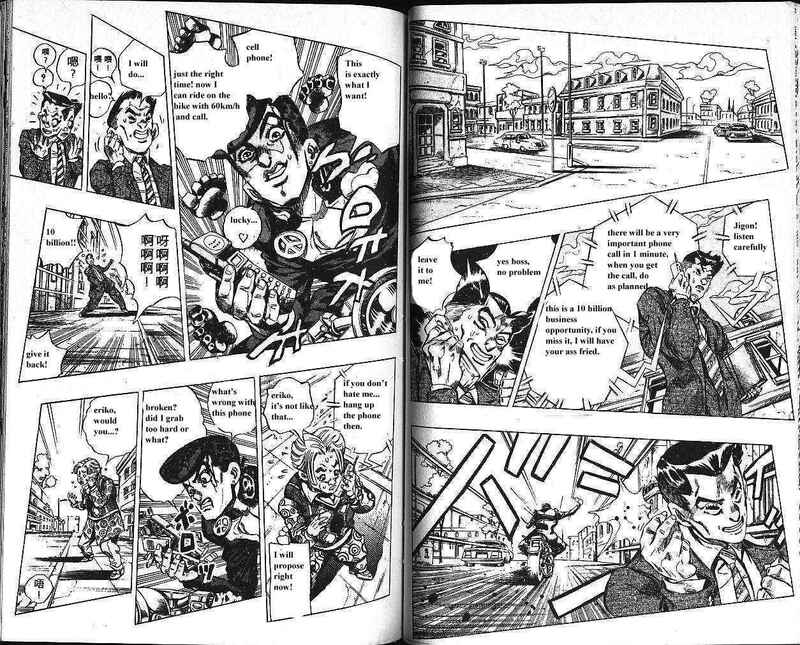 JJBA gets up to plenty of out-and-out ridiculous stuff, but these phone-grab scenes are some of the better examples of it nailing under-the-top comedy with the practiced finesse of an author who’d already been in this business a decade since a decade ago. Masaya Tsunamoto’s 2010 KMA-winning professional soccer manga Giant Killing is a very unique piece of material. 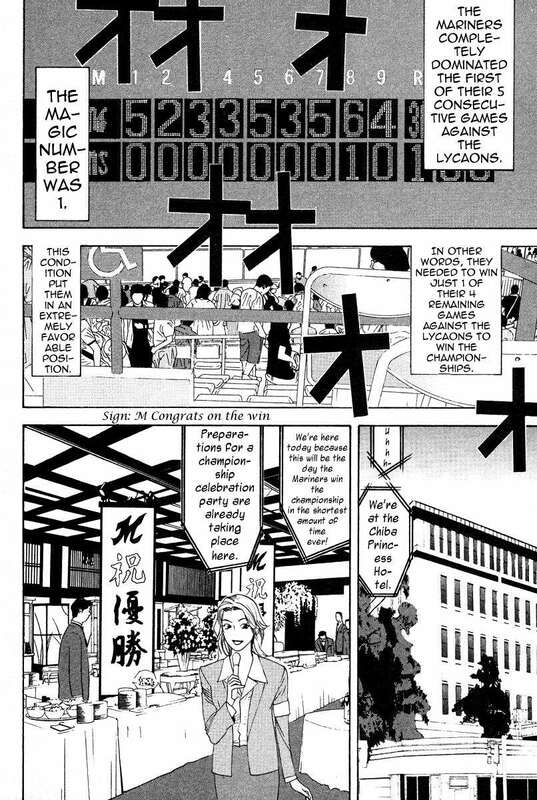 Unlike most sports manga, it follows the development of a team in a professional league over the course of a rather realistic season, where losses and draws are as common as wins. It also stands out for putting the focus of the narrative not just on the athletes and the disgraced ex-player returning from England to coach the team, but also on the team’s fans (from the 40-something fair weather fans who don’t travel well to the 20-something hooligans who cheer loud and riot louder) and its front office (who have to deal with bad press when things aren’t going so well). Indeed, the story of the manga opens with staff from the front office on a trip to England, trying to lure the team’s former ace Tatsumi back to Japan as the team’s manager. And the very next story deals with the negative light in which the fans view Tatsumi, who quit the team at the prime of his career. Only after these two dynamics are introduced does the manga start playing any kind of soccer. It’s a three-pronged approach to soccer which gives the reader a much deeper understanding of the layers of culture within professional sports. The series has recently been in the middle of an extensive gaiden arc, telling the real story of why Tatsumi left the team. It turns out that decision was less selfishness and more the fault of a system that forced him, albeit somewhat willingly, to the breaking point. This weekend, I sunk my teeth into the seventh installment of the Jojo’s Bizarre Adventure series, cheating a little bit as far as part order order goes. * It ended up being a very worthwhile decision, as I found the series contained bite after juicy bite of ridiculous (but not incomprehensible) content. It’s got everything from non-superpowered horse racing to dinosaur fights to spy-novel style infiltration scenes. It didn’t take me long to plow through the whole story, which integrates both a continental horserace and an epic bodyhunt. 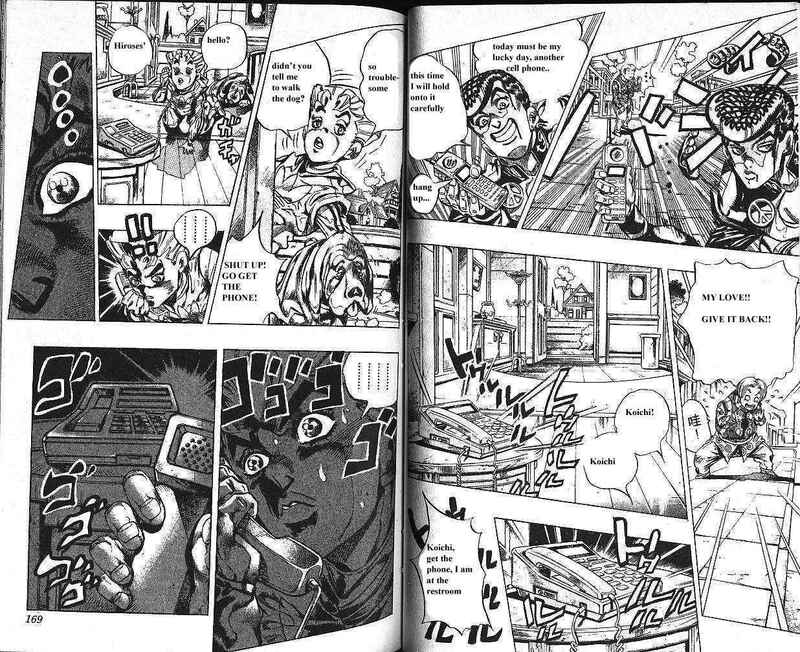 SBR is far from a perfect series,** but it’s got mad merits on writing and the way it uses full-page spreads to lay out a scene. So that’s the general setup, introduced in the chapter prior to this one. 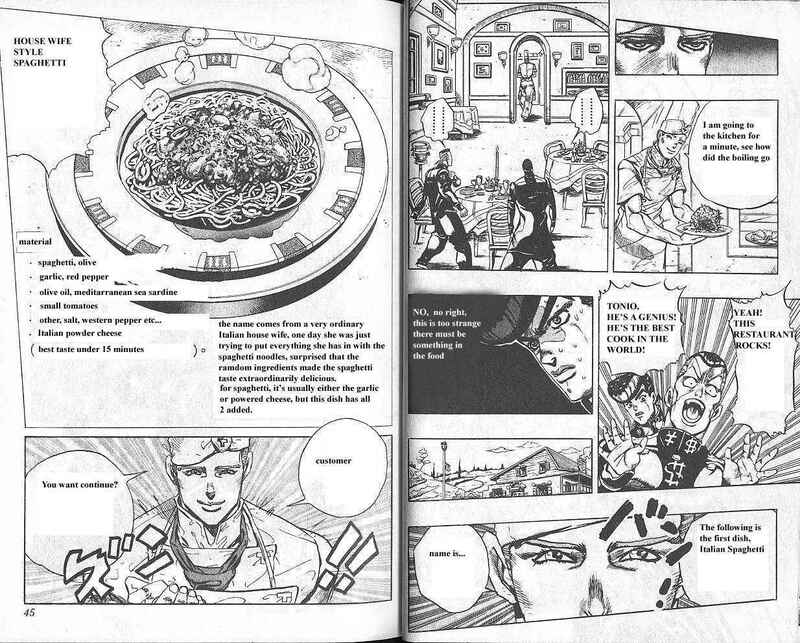 Also in the prior chapter, protagonists Gyro and Johnny managed to finagle a couple of necessary body parts off of Sugar Mountain by correctly negotiating the Golden Axe rule of her stand. Beyond the body parts, they’ve acquired a diamond, gold ore, a fancy watch, and $50,000 in cold hard cash. This chapter follows them trying to avoid becoming petrified wood by burning through their Leprechaun Gold via fair trade. All while being chased by a bunch of government assassins. If you think that sounds like the basis of a hilarious heist comedy’s third act, well, you’d be more or less on the money. Scans for this chapter apparently came out a long time ago. I can’t not talk about this series. The art is too good, the characters too engaging, the storyboards too crisp. This chapter follows the lead couple, Tetsuo and Akira, on a date to the beach as the former is recovering from some weird but very profound depression and makes good use of shading to show that off. This chapter doesn’t contain that much in terms of raw plot. Its entirety consists of 3 scenes: Tetsuo arriving at Akira’s apartment late and without the canvas he had discussed bringing along, the two on the train with Tetsuo acting increasingly awkward, and the two at the beach. The first two scenes serve to show Akira noticing how off Tetsuo is, and the third scene is about Tetsuo swimming out into the depths before eventually coming back to Akira and just lying there. It’s a relatively simple premise for a chapter packed with emotional nuances that lend it a ton of depth. 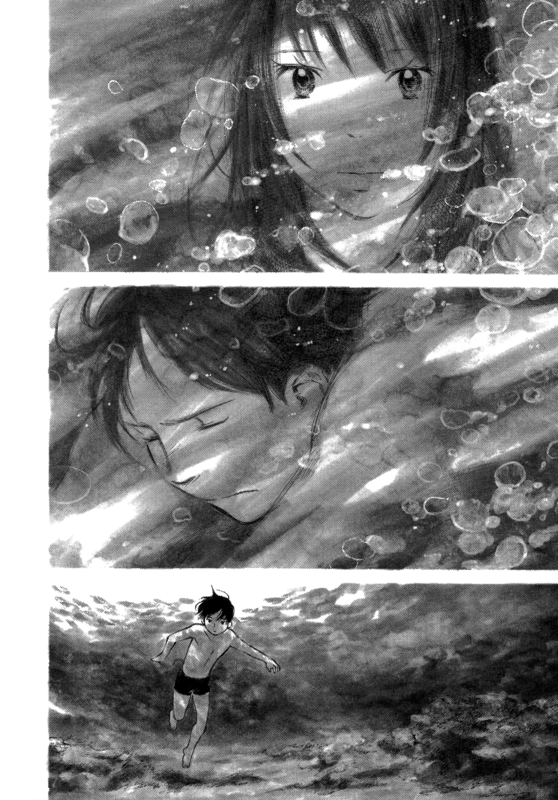 It’s harder to go into more detail without simply breaking it down panel-by-panel, but the manga does a particularly excellent job this chapter of illustrating Tetsuo’s improving mood by dramatically shifting the shading from dark to light as he swims back towards Akira. 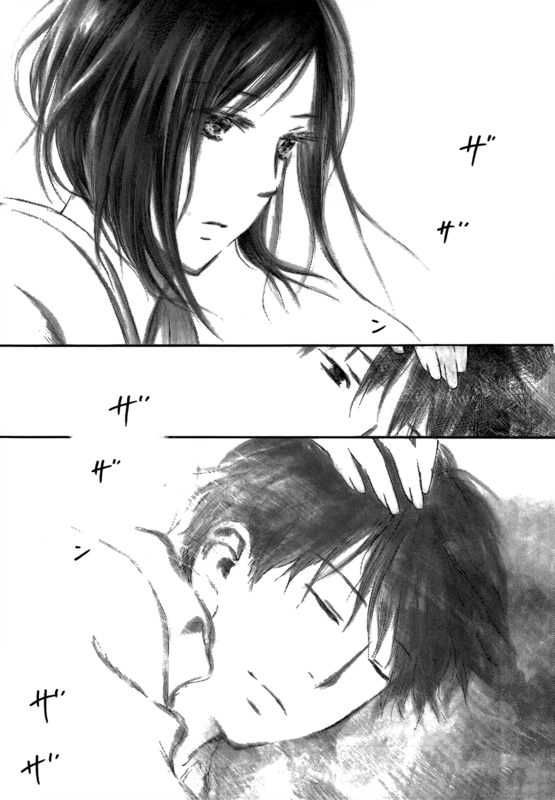 This dynamic results in a number of very touching, tranquil pages like the one below, pages that make the manga a very easy one to read over and over.